Designer Ciaran Bagnall writes for Culture about his work on The Gate Theatre's celebrated immersive production of The Great Gatsby, which runs until February 16th. I was honored to be in the room when Selina Cartmell was first able to announce publicly that she would be the next Artistic Director of The Gate Theatre. We were working together on her production of Three Sisters at the Lyric Theatre in Belfast. Overjoyed for her I never thought in my wildest dreams that I’d be a part of her opening gambit! In an extraordinary act of bravery Selina had opted to open her first season at The Gate with an immersive production of The Great Gatsby. Literally bursting The Gate Theatre wide open for the public to live and experience a production never before seen within those walls. With over 26 spaces used by the production within the building it was an extraordinary challenge. I was invited to meet Alex Wright, the original adapter and director of the production that Selina had seen in London and we instantly connected. I’ve quite a few years experience in designing immersive, site responsive and site specific theatre and the idea of being able to transform this beautiful eighteenth century building literally into the Great Gatsby's Mansion was a huge privilege and a once in a career opportunity. We began quite quickly and over the next few weeks I began the journey into the text of the wonderful Great Gatsby. As a storyteller, F. Scott Fitzgerald has a phenomenal ability to create a hugely rich and lush visual text. The novel is overflowing with stunning images - "in his blue gardens, men and girls came and went like moths among the whisperings and champagne and the stars". It was difficult to lock down which visuals to include and which had to be left to compromise. I began with the outside of the building placing the eyes of Dr. T.J Eckleburg high as possible on the roof of the building, watching all those walking along O’Connell Street. The windows at the front were also dressed in an Art Deco design and we used the famous "green light" to light the very entrance to the building. With over 26 spaces used by the production within the building it was an extraordinary challenge. It was hugely important to Alex and myself that the whole building lived and breathed the production. There wasn’t a single inch of that space that wasn’t clearly considered. As the audience enter the box office they are faced with a corridor of mirrors - one of the key themes of the novel is it’s obsession with what appears beautiful from afar, but in closer inspection doesn’t quite live up to the expectation - so the mirrors facing into each other allow the audience to not only observe themselves dressed for the Gatsby party but also others, from different angles, so perhaps we see a different view. In the main auditorium, we celebrate and enjoy the huge opulence of the main dance hall at the mansion but behind that stunning staircase and Georgian windows we see the "seedier" world of the drugs-store, the illegal liquor den and from that view we can quite clearly see that the windows and staircase facing into the main ballroom are fake. Having utilised every space possible for the production, we then had an issue with the lack of cloakroom space! We had unbelievable support from the building itself, with literally every member of staff being a part of the transformation. We had to make sure the box office staff, the bar staff, the front of house staff, the cleaners, everyone, understood their importance to this world that we were all making together. The design could only work with the help of everyone involved. During the preparation and build of the production we had numerous "original" challenges. Having utilised every space possible for the production, we then had an issue with the lack of cloakroom space! Wishing our audience to have the best experience possible, we needed to make sure that they were able to leave any unnecessary coats or bags that may hinder the party spirit! So the bowels of the building were also transformed into a "backstage" at the mansion area to allow a much better flow of audience through doors of the mansion. For me this has easily been a highlight of my career. To have my design supported and realised by such extraordinary people such as Jim O’Connell, the Gate’s phenomenal Production Manager. Val Keogh, our Production Coordinator, the entire stage and lighting crew, our cast and fellow collaborators such and Peter O’Brien for Costumes and Isobel Waller-Bridge for composition and Muirne Bloomer for Choreography has been an experience I’ll never forget. The scale and ambition of this production was only ever possible with their immeasurable skill and talent. I will forever be in their debt. 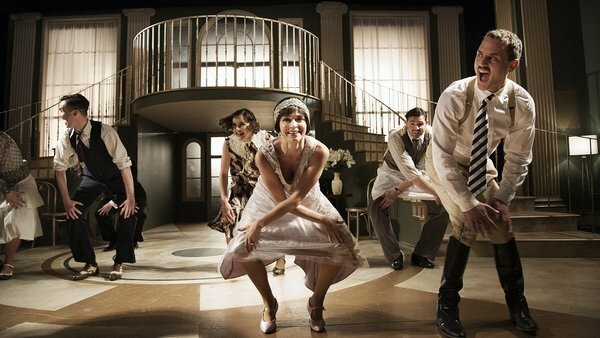 The Great Gatsby is at The Gate Theatre until February 16th - more details here.